Just when you thought the heroin epidemic was bad enough, now we are seeing a new and even worse epidemic - Fentanyl. We started to hear about Fentanyl since it has been a contributing factor in many recent overdose deaths. Over the last year or two, there have been many clusters of fatal overdoses in communities all over America - often 10 or more people dying in one community in one weekend. And the cause has been found that people who were buying heroin on the street was mixed with Fentanyl. Fentanyl is a synthetic opiate, just like Percocet, oxycodone, heroin and all of the others - except it is even more powerful, and even more deadly. Fentanyl is 50 times more powerful than heroin. It acts quickly and it seems to shut off the breathing control centers in the brain even more than other opiates. Fentanyl has been used with medical patients for over 30 years. It is very fast acting, and very powerful, so it is used routinely in anesthesia to put patients to sleep. It does its job of putting someone into a complete coma very efficiently, but if the patient is not intubated and on a breathing machine, it stops them from breathing and the patient dies very quickly. Now, Fentanyl is readily available on the streets, and it is causing a lot of fatal overdoses. Last year, just in New Hampshire, Fentanyl killed five times more people than heroin (158 Fentanyl overdoses versus 32 heroin overdoses). Fentanyl is now available on the streets because drug cartels in Mexico have figured out an easy way to increase production. There are some reports that it is even easier and cheaper to make than heroin. Illegal labs in Mexico are producing the drug in record quantities, and it is turning up in drug busts in America in record amounts. Fentanyl seems to be even more addictive than other opiates. Fentanyl is about 100 times more potent than Morphine. It is so addictive because it acts very quickly in the brain. There is now a lot of evidence that the faster a drug acts and causes a Dopamine release in the brain, the more it is addicting. Fentanyl is extremely fast acting. It is the drug of choice for most anesthesiologists who themselves have a drug addiction. Most of these physicians will tell you that the drug was so strong and so pleasurable that they became completely dependent and lost all control within a week or two of trying it once. Fentanyl is also more dangerous because it is so potent. While heroin is measured in milligram doses (1/1000 of a gram), Fentanyl is measured in micrograms (1/1,000,000 of a gram). It is almost impossible to measure the dose accurately, because the quantity of powder is so small. It would be difficult even for a trained pharmacist with accurate scales and equipment to measure a dose of Fentanyl accurately. 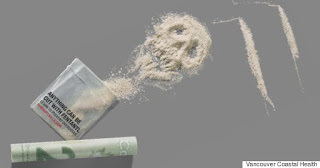 The thought that addicts are buying a white powder on the street, they have no idea of the concentration or purity, and then, they have to calculate how much to take so they get a safe dose is truly frightening. Even worse, now when Fentanyl is mixed in with heroin, the drug user will most likely have no idea of the presence of Fentanyl. I am very worried about this drug and what is likely to happen. There are a many reports when street addicts hear about this more powerful drug, that is causing overdoses, they are trying even harder to get their hands on it. They want a powerful high and they want a drug that is stronger, so it will be less expensive. They all believe that they will be able to control it and they won’t use too much. They have no idea what they are getting in to. Even trained anesthesiologists have a high rate of fatal overdoses when they use this drug. Now that Fentanyl is easier to produce, there is a high demand on the street, and use is increasing, the situation is only going to get worse.